As a retail company, you may think the missing part of the cake can be found in Travel retail, and that you can just cut and paste all the strategies applied to the point of sale in the local markets and apply them to Travel retail, but I´ll tell you what, it is not a land for beginners. With a massive retailers consolidation scenario, negotiations are getting extremely tough between brands and retailers and this reality affects all involved in the chain, including us, retail agencies and shopfitters. Spaces are limited, expectations are high and budgets are tight… but still, there is something magical about creating shopping experiences at airports. Shoppers behave differently towards your display, there is more appreciation and involvement. Many pilot fixtures and retailtainment initiatives are tested in this channel, and once you get it right, Travel retail can represent an important percentage of your company income. 2 days of the 4 exhibition days were not enough to see 516 exhibitors, with 25% of them being Perfumery and Cosmetics brands, our main client profile. We saw the strong presence of Asian exhibitors and many Korean visitors. 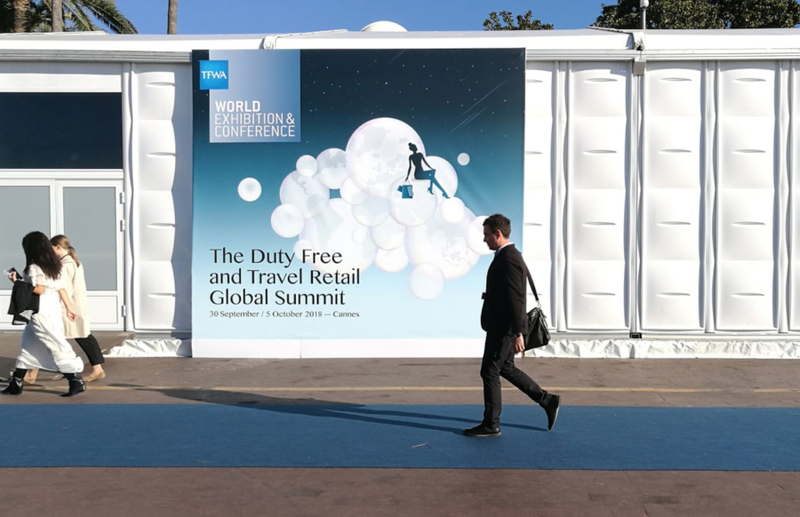 Indeed there´s a TWFA happening in Singapore, but the Cannes edition seems to be the number 1 choice for brands and retailers…and consequently, for retail agencies & shopfitters. There was also a digitalisation atmosphere, something that for Travel retail was always a slow run towards the local market. We were hypnotised by a suitcase following, almost magically, his owner though the expo corridors… funny gadgets, big investments. As said by Erik Juul-Mortensen, TFWA president, the TR industry objective is to over-deliver on the expectations, and so is ours. We have listened to our clients, got inspired by the Asian brands, investigated the digital possibilities, and basically, mingled with the duty free universe.